Tens of thousands of men of South Asian, Arab and Muslim origin are debating whether to comply with a new US immigration registration programme. The fear is that they may be detained or deported and so separated from their families. Since the programme began, 1,200 men have been directed to attend deportation hearings. Pakistani Foreign Minister Khurshid Mahmud Kasuri has said the issue will be high on the agenda of his current US visit. The new rules have led to a sense of panic in immigrant circles, especially the large Pakistani community. The new registration programme has two parts. Under one, men and women arriving in the United States since last September on temporary visas have been required to register at airports and other ports of entry. Under the other, men aged 16 and above from 25 nations who arrived in the US by last September are required to register at the offices of the Immigration and Naturalisation Service (INS). Except for North Korea, all the nations are heavily Muslim. Mohammed is a Pakistani citizen who has lived and worked in the US for the past two years. His application for a work visa was rejected after the 11 September attacks and his current, temporary visa runs out this month. He believes that if he takes part in the registration programme, he runs the risk of deportation. Rather than face that, he has decided to leave for Canada. "I'm a professional man; I'm a pharmacist. I came with the hope that I would make a fortune over here," he says. "But due to these new rules and regulations, there is a lot of discrimination against especially Muslims. Now I am changing my mind." No country has been more critical of the new rules than Pakistan. On Tuesday at the United Nations, Mr Kasuri said Pakistan had been a valuable ally in the war on terrorism and that he would seek concessions on behalf of Pakistani nationals. "The first Pakistani immigrants to the US were doctors, computer scientists, engineers and in the United States their contribution is recognised," Mr Kasuri told the BBC. "There are many rural communities where medical facilities would fail if you didn't have Pakistanis as doctors and nurses. "Our appeal to the American administration is going to be: Look at their track record; they have family values. They are people who not only support their families here; they support their families in Pakistan also. "They are not the type of people, not the material, that terrorists are made of," Mr Kasuri said. In spite of the large number of people of different nationalities arrested or deported since registering, Jorge Martinez, spokesman for the US Justice Department which oversees the INS, denies that people are being unfairly treated because of race. "The criteria is solely based on intelligence-based matters and national security concerns. It has nothing to do with a person's race, a person's religion or a person's ethnicity," Mr Martinez says. "There are individuals who, unfortunately, are here unlawfully or illegally and there have to be consequences if you break the law. "We have identified several individuals for known types of terrorism. These are very serious individuals and obviously their crimes do not render them admissible here." Aziz Ahsen is a Pakistani-American lawyer who has been giving legal advice on the registration programme to Pakistani immigrants in New York. He says it is difficult to know what to advise because some people who have overstayed visas but are awaiting a decision on whether they can remain are being thrown out after registering. "Some of these people are taxpayers. 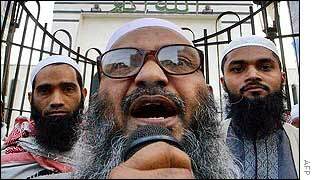 They are residents of this country; they are good people," Mr Aziz says. "People who are basically out of status for some small reason should not be subjected to this treatment. "Prior to 9/11 nobody would have even questioned their contribution to American society." For those whose visas have elapsed but whose children were born in the US and are therefore American citizens, the treatment is particularly harsh. "That is the problem we are trying to bring to the attention of the INS. "Unfortunately, with this massive deportation that we are seeing, by the time the system kicks in to help these people, some have already been deported."